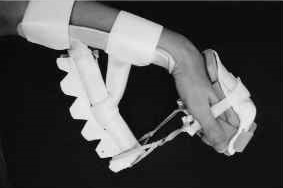 The ‘Dinosaur Orthosis’: An Orthosis for Static Progressive or Dynamic Wrist Flexion and Extension. Recently the Practice Forum of The Journal of Hand Therapy featured the orthotic design, the “Dinosaur” orthosis. 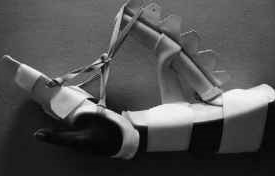 This is a static progressive or dynamic orthosis for patients with limitations in wrist flexion or extension. www.jhandtherapy.org for subscribers… Arnold, S., & Janson, R. (2017). Wrist extension or flexion mobilization orthosis: The dinosaur design. Journal of Hand Therapy, 30(1), 109-112. 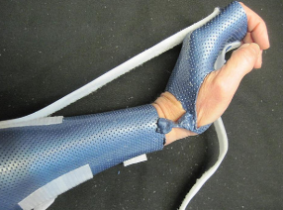 The authors explain, step-by-step, how to fabricate this orthosis, which can be applied in both directions to help patients regain passive wrist motion. This orthotic design is not new to most therapists, but the easy to follow format of the fabrication steps could be of help. The tension force on the metacarpal bones must be positioned at a 90° angle, which explains the height of the outrigger. We would recommend Orfit Flex NS 3.2 mm for this specific design. Do remember to remove the coating and use dry heat for secure bonding. As the ‘Dinosaur orthosis’ is rather bulky, heavy and may not appeal to all patients, we suggest some alternative orthoses below. Thermoplastic Hinges: Eliminating the Need for Rivets in Mobilization Orthoses. In 2012 an alternative design was published on the Practice Forum of the Journal of Hand Therapy. 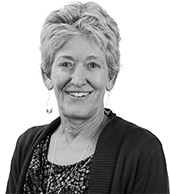 Schwartz, D. A. (2012). Thermoplastic Hinges: Eliminating the Need for Rivets in Mobilization Orthoses. Journal of Hand Therapy, 25(3), 335-341. This similar type of orthosis is less cumbersome, easier to fabricate and easily removed by the patient. For this orthosis we suggest Orfit Colors NS 2.0 mm. Velcro or Elastic strap: an orthosis designed by Jean-Christophe Arias. 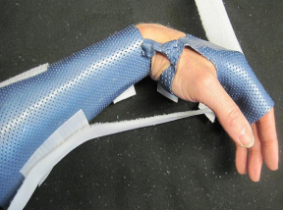 This design places a wide Velcro or elastic strap across the dorsum of the hand, which pulls the wrist into flexion, or on the volar palm, which pulls the wrist into extension. This design was fabricated with Orfilight Black NS 2.5 mm and Orficast for the hinges. The latter two orthotic designs both feature wrist hinges of thermoplastic material. Preventing compression of the wrist carpal and forearm bones by maintaining the distance at a constant. This allows for a sleek and low profile design where the wrist can be pulled into the desired direction in its protected axis of motion.